The Bulbul reigned the music garden of Punjab for more than 35 years and then flew all of a sudden to the mystic skies from where no one returns. PARAMJIT KAUR TALWAR visits some of her relatives and friends while paying her homage to the departed Queen of Melody. Narinder Biba was born on the auspicious Baisakhi day of 1941 to Sardar Fateh Singh and Bibi Mahender Kaur at Chak No. 120 in Sargodha District.(Pakistan). Later in 1947, the family settled in village Khumna near Amloh, Patiala district. During her early years, she used to sing shabads along with her father and won numerous prizes. Realizing her aptitude in music, her father decided to get her trained by some reputed music teacher. He chose Master Hari Dev and Lal Chand Yamla Jatt, as her classical (vocal) and folk tutors respectively. With passage of time, she did her Gyani from Punjab University and Master in music (Sangeet Bhaskar) from Pracheen Kala Kendra, Chandigarh, She was a rare example to have-been trained in classical music along with the folk. Indeed she moved heavens and earth to achieve the ambition of her life and ultimately became a known voice in the field of singing. Soon her fame spread everywhere like a wild fire. At the time of the inauguration of Goraya Transmitter of All lndia Radio, Jalandhar, she was requested to give a performance at the occasion, which she did with the song 'Khushi diyan vangan ni main kal nu Charahauniyan' and became a celebrity. At that time she was just seventeen years old. However, the first stage performance of -her career started with the song 'Uhne kahiyan te mein na suniyan...' Her f irst song recorded by HMV was Gurdev Mann's ‘Aa ha chaliye schoole ik war harha ve...' which was' broadcast by Jalandhar Radio Station several times on the listeners' demand. Her golden voice was appreciated by music lovers and there after, she was invited by dignitaries like, Partap singh Kairon, Gurnam Singh, Lachhman Singh.Gill, etc. and music lovers of countries like United States of America, Canada, England, Dubai, Germany. She did not restrict her concerts to cities only but also performed at the village-level, Hardly can one name a village of Punjab where she had stolen the show with her melodious voice. 'Gal soach ke karin tu zaildara asa nahin kanaurh jhalni' ‘Ah le maye sambh kunjian dhian kar chaliyan sardari’, 'Pase hat ja zalma panjaban jatti aaye..J, 'Mainu reshmi rumal vangu rakh mundiya...''Kahnu .marda chandriyan chhamkan ve kach de glass vargi...', 'Garhva lei de chandi da...', 'Hathi toren sajna nu nale yaad karan nale rovan...', 'Rati see udikan teriyan sute pal na hijar de mare," Chandigarh rehan valiye.., 'Chitiyan kapah diyan phutian hard ni pat hare hare., 'Kikar te kato rahendi kalla na jayeen khet nu. etc. are some of her songs which would ever be tscalled by Punjabis. Though she will no more interact with us yet the memory of her voice will remain in our hearts forever," remarked Mr. C.L. Bhalla, the Music instructor at Punjab Agricultural University, Ludhiana and a great admirer or Biba's voice. Among the historical songs which became popular we! 'e, 'Gaya hai Ajit hun Jayega Jujhar...', 'Chan Mata Gujri da sutta Kandiyan di sej vichha ke...', 'Do bariyan kimti Jindan, nihan vbh aa khlo gayeah..i etc. Moreover, operas like Guru Ravidas, Saka Saihand, Saka Chandni Chowk, Mirza Sahiban, Sassi Punnu, Heer Ranjha were among the most famous ones. She sang for about two dozen Punjabi films like Daai, Dharamjit, Putt Jattan De, Teri Meri lk Jindri, etc. Nand Lal Noor Puri Award was the first prestigious honour won by her in 1972 which made her a renowned stage artist. She was honoured by the Government of Puniab too. Biba ruled the Punjab folk music scene for almost four decades and had, in fact, won all the famous awards of Punjab. lt was 20th of October, 1989 when heavily garlanded and seated on an immensely ornamented elephant, she was taken from her residence to Punjabi Bhawan Ludhiana with great pomp and show. There, she was awarded the Professor Mohan Singh Yadgari Award in which she was offered a Gagarfull (brass pitcher) of silver coins. At the age of 19 Years, Biba tied the nuptial knot to Jaspal Singh Pali, a railway employee and a playwright. He was a compere above Par and used to accompany her in shows. Unfortunately, he died after a brief illness in 1976. The couple had four issues, two sons and two daughters, all with an inborn talent for music. Though Biba was a singer Par excellence and touched amazing heights in the world of singing yet she did not encourage her children to follow her footsteps. For Tej PartaP Singh and Gurpartap Singh, her two sons employed with London Airlines, Narinder Biba was ' guru, philospher' guide and of course, a real friend'. Both the England-settled sons admiringly recollect the first performance of their life in 1990' sponsored by Million Dollar Club. " lt was just unexpectedly that the President of the Club approached our Mom, the moment he came to know that she was on her visit to our place' They acknowledge that it was just ten days training imparted by their mother and the show turned out to be a real success. "Perhaps the only dreams which remained unfulfilled were to make cassettes along with her two sons of which she spoke off and on and the' Academy Award which she rightlY deservedi' asserts Amir Singh Rana, her Ludhiana-settled brother. 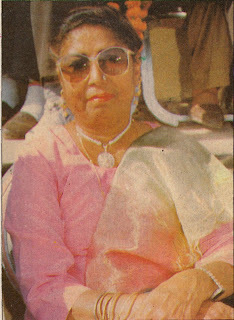 Biba was, in fact, the first ladY to enter Punjabi films aq a renowned singer whose all songs turned out to be superhits. She sang duets with Muhammad Rafi, Asha Bhonsle, Mahendra Kapoor; Surinder Chhinda, Jagat Singh Jagga, Karnail Gill, Didar Sandhu, Harcharan Grewal and many more. She had also performed along with the well renowned Alaap Group of UK. She had sung almost 7,000 songs which include Lok Geet, Boliyail, Tapai, Love-lorn stories of Sohni, Heer, Mirza, etc., historical songs relating to the valour of Sikh Gurus and shabas. Her long hek at the beginning of a lok Geet and high pitched voice were typically well-known among masses. 'Her accompanist Beli Ram who is well-known Algoza player was always seen with her whenever she sang 'lok geets', from time to time, her three brothers used to give her company in concerts. 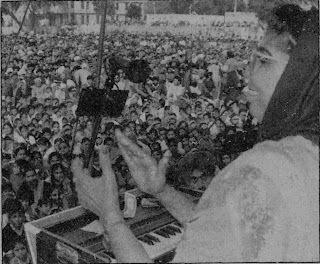 She sang 'Mirza Sahiban' and brought out a cassette Mela Vaisakhi along with her brother, late Fakir Singh Fakir. Even in the age of westernization when Punjabi singers have turned to rap and use western instruments and synthesisers. She retained the use of traditional instruments in 'her shows. She was against westernization of Punjabi music and was an admrier of Pakistani Punjabi singers who maintained the sanctity of folk music. Fondly known as the Nightingale of Punjab to her fans, she was called 'Punjab di bhain' by the famous film star Dharmendra and was deeply respected by one and all.' No one called her bY name rather from everyone's lips one could hear her being' called bhain ji (respected sister). She was appointed as the President of the Lal Chand Yamla Charitable Memorial Trust which was started barely three years ago. Since its establishment under her able and efficient guidance melas were organized every Year where reputed folk singers were honoured and invited to perform. Biba worked for social causes too and undertook the cause of marrying off needy girls. She had in fact adopted some poor children and arranged for their rehabilitation, She also helped in releasing the cassettes of budding singers who could not atford it and even introduced them to HMV. lndeed a simple and sweet natured lady, she had no ego hassles. Apart from singing, her favourite pastime included gardening and reading good books. Biba, a Proud grandma of seven grand sons and three grand daughters, was an adorable lady. To be with her family members was the most rejoicing recreation for her. Nonetheless like a strict martinet, she. used to do her usual Riyaz, the practice, for at least two hours daily. "During her days of recording, she used to spend the whole day at Riyaz with short breaks to have just a cup of teaj' recalls her brother, Amrik Singh Rana. She had the credit of releasing at least one cassette each year. She preferred to sing her own compositions as she herself was a good composer. Moreover, she had a permanent contract with HMV. Basically a vocalist, she was good at harmonium', piano, sitar and tabla too. According to Jagdev Singh Jassowal, President Professor. Mohan Singh Sabhiyacharak Manch, "She respected classical vocalists a lot and was surrounded by them most of the time. It is my personal suggestion that a Trust be established in her name where competition of female singers should be arranged each year and winners be duly rewarded. Further, the budding singers of Punjab may also be encouraged through scholarships in her name." She was preparing for her tour to United States next month, but Almighty desired otherwise. Her untimely death due to heart failure on June 27th this year was a shock for many. from abroad. To name a few, S, Gurdev Singh Badal, ,Agriculture Minister of Punjab, Charanjit Singh Atwal, Speaker of Punjab Assembly, Tarsem Singh Jodhan ex-MLA, Amar Noori, Mohammad Sadiq, Surinder -Chhinda, Gurdev Singh Mastana, K. Deep, Parminder Sandhu, Surjit Gill, Charan Singh Safari, et, all attended the funeral. A special programme of two hours was broadcast by the BBC as a tribute to her. Television and radio stations in Canada also aired her songs. Though the void created by her death cannot be filled, she would forever live in the hearts of the Punjabis and would be remembered by them fondly.